Venezuela’s opposition has taken a hit after one of its leading members announced he was leaving the coalition. Henrique Capriles, an ex-presidential candidate, said the move was in protest at the decision by four newly elected opposition governors to pledge allegiance to the constituent assembly. The Roundtable for Democracy (MUD) regards the assembly as illegitimate. Four elected opposition governors caved in to the ANC yesterday, making everyone with common sense, a memory, and the ability to feel shame, look foolish. The governor of the central state of Miranda, who spoke as “leader of the MUD” at a press conference, said that the first of the coalition’s requests is for a “humanitarian channel” to be established so that other Latin American nations may send containers of food and medicine to the country to alleviate scarcity in those areas. “What are we expecting on Friday, gentlemen of the government? Pick up the telephone, open up a humanitarian channel in Venezuela immediately, in the next few hours,” he said. Capriles also said that on Nov. 11, when the second meeting among the participants in the dialogue process is to be held, including representatives from the Union of South American Nations, or Unasur, and The Vatican, it will be announced when “general elections” will be held. “There’s no way that there will be economic change in Venezuela while these same people remain in the government. These people have no way to change, they believe that they are fantastic, that they are making better decisions. They are defending their model, so they’re not going to change,” he added. The MUD leader said, however, that the prospective general elections do not nullify the demand for a referendum to revoke Maduro’s mandate since such a plebiscite could lead to other elections. He also said that, taking into account that the terms of two of the five members of the National Election Council will lapse on Dec. 4, MUD hopes that new election officials will be agreed to within the dialogue framework prior to that date. He also called for “respect” for the National Assembly, where the opposition holds a majority, given that the decisions the chamber has taken have been annulled by the Supreme Court, which MUD accuses of rubber-stamping the government’s decisions. The other two points MUD is insisting on have to do with releasing people it considers to be political prisoners and incorporating the defense minister, Gen. Vladimir Padrino Lopez, into the dialogue process “as the top representative of the armed forces” to guarantee that the agreements are complied with. Over at Caracas Chronicles, Francisco Toro doesn’t have a clue as to What will President Trump mean for Venezuela? As mentioned earlier, Nicolás Maduro declared a three-month state of emergency broadening the scope of an economic emergency decree in effect since January that was set to expire last Saturday. Yesterday the National Assembly voted to reject Maduro’s decree. Venezuela’s opposition has come out in open defiance of the government of President Nicolás Maduro, telling its supporters to ignore the state of emergency decreed over the weekend. “If Maduro wants to apply the decree, then he should start bringing out the tanks. We’re not going to accept it, and I am calling on the country to take no notice of the decree. I am saying this to the armed forces, for whom the moment of truth is coming… We don’t want a military solution, but this is unacceptable,” said leading opposition figure Hector Capriles [sic], the governor of the state of Miranda, on Tuesday. The BBC reported Wednesday that opposition leader Henrique Capriles accused Maduro of “putting himself above the constitution” by imposing emergency powers on the oil-rich nation. “I tell the armed forces: The hour of truth is coming, to decide whether you are with the constitution or with Maduro,” Capriles said. Even the phrase “falling apart” fails to convey the scale of destruction that has befallen the country. To capture a sense of it one must turn to the vivid prose ofNicholas Casey of the New York Times complemented by the accompanying gruesome photographs. He describes hospitals that are places where patients lie in rotting mattresses or in pools of their own blood. Where doctors amputate the limbs of patients because they have no antibiotics to treat simple infections. Where doctors and nurses take turns operating respirators by hand — the machinery sometimes broken and without power anyway — until they simply collapse from exhaustion and helplessly watch their patients die. Yet this same scene is one which Nicolas Maduro — like Corbyn and Sirota 3 years earlier — still has the effrontery to view with satisfaction: “I doubt that anywhere in the world, except in Cuba, there exists a better health system than this one”. In this phrase all is clear. What’s Socialism, Dad?Venezuela provides a lesson to anyone tempted to feel the Bern. Linked to by the excellent Diplomad. Thank you! Linked too by GeorgiaPol. Thank you! Venezuela’s National Guard has clashed with opposition demonstrators who were marching on the headquarters of the country’s election commission. Venezuelan police used tear gas twice against opposition presidential candidate Henrique Capriles as he was trying to participate in a march to the National Election Council in downtown Caracas, the access to which was blocked by officers.Capriles, who is also governor of Miranda state, was affected by tear gas sprayed at him by a Bolivarian National Police officer as he was trying to negotiate passage for the protesters into the downtown area. The demonstration was intended to pressure the CNE to move to the second phase of organizing a referendum to recall President Nicolas Maduro. Let me see if it posts bigger this time. This is Caracas today. These are hungry Venezuelans protesting that their children are dying from lack of food and medicine. That they have not enough water or electricity. This is a country with more oil than Saudi Arabia. And the government has stolen all the money and now they bottleneck peaceful protesters and threaten them with bombs (I know: I have friends in the crowd). Or haul them to prison and torture them. Are you still thrilled with your Bolivarian Revolution all you buddies of the late Hugo Chávez: Oliver Stone, Naomi Campbell, Sean Penn and the editors of The Guardian newspaper? Is this what you wanted all you idiot celebrity apologists? Are these the human rights you had in mind for us? Your silence is deafening. Stand up and be counted. Admit your mistakes and turn on the oppressors you once so vehemently supported and used your media power to enable. Why don’t you go make a documentary about this, Oliver Stone? The problem for the regime is not how to replace Maduro but with what. President Maduro told his Chinese counterpart, Xi Jinping, that the main goal of his trip was to further consolidate and expand the strategic partnership between the two countries that late President Hugo Chávez began with Chinese leaders. Chávez died in March after 14 years in power. The two leaders signed 12 agreements on Sunday, including ones related to a finance fund deal, education, and a joint development between Chinese state-owned oil producer Sinopec and Venezuela’s national oil company. They also signed a cooperation and exchange agreement between China’s space flight administration and Venezuela’s science and innovation ministry relating to remote satellites. No details were given on any of the agreements. The $5 billion will be invested in the country, through a credit from the China Development Bank (BDC) for the financing of strategic projects in the field of health, science road, transport, technology, industry, electricity and mining, which will improve the quality of life of the Venezuelans. “With this Bank funding we will develop also the Las Cristinas mine. All for the benefit of our beloved people,” wrote Maduro about the long delayed gold mining project. El Sistema Integral de Protección Ciudadana (videovigilancia) acordado con China, tendrá su primera aplicación en el Mcpio.Sucre de Miranda! 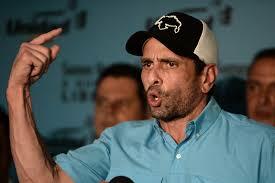 It so happens that the governor of Miranda is Henrique Capriles, opposition leader. More on Maduro’s Chinese deal at Caracas Chronicles. The event took place amid growing criticism that Capriles had wasted an opportunity in the days following the April election, when many of the millions of Venezuelans who voted for him were willing to take to the streets to protest and he asked them to stay home.